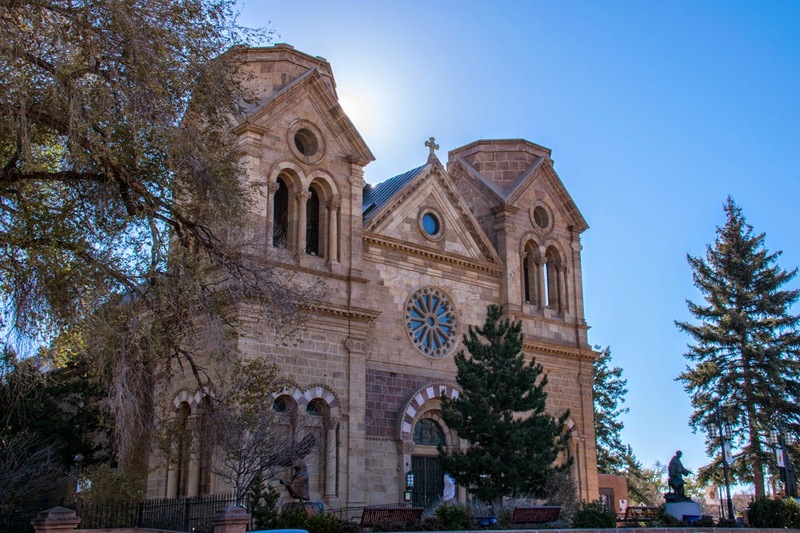 This day we started off with a walk through the area we were staying in Santa Fe. There was a hiking trail right off the property that wandered through the hills of the neighborhood we were staying and led into Hillside Park and Fort Marcy. The sun was just coming up but was still trapped behind mountains lengthening the dawn. Chena led the way. We were joined by a neighborhood dog, a goodlooking fellow with gold eyes that matched his golden coat. Ravens flew by making knocking and raspy cawing sounds. 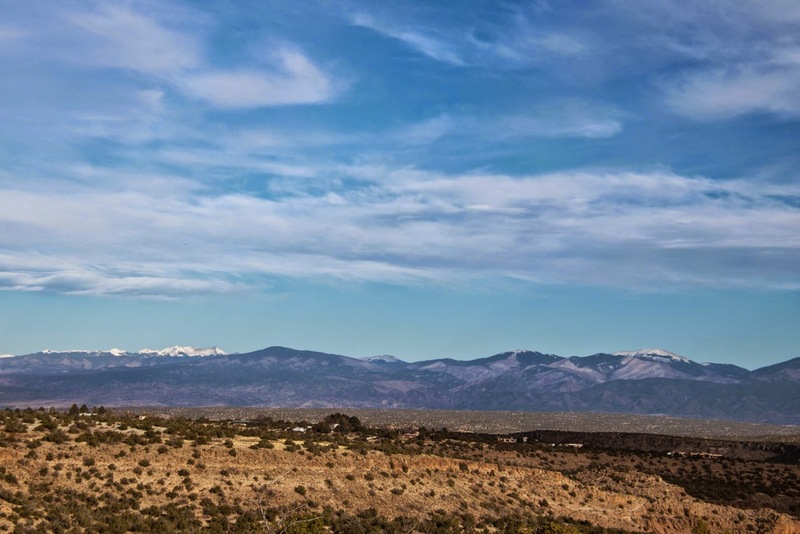 Looking down into Santa Fe from our hilltop location. The suns first rays hitting the hills to the west. 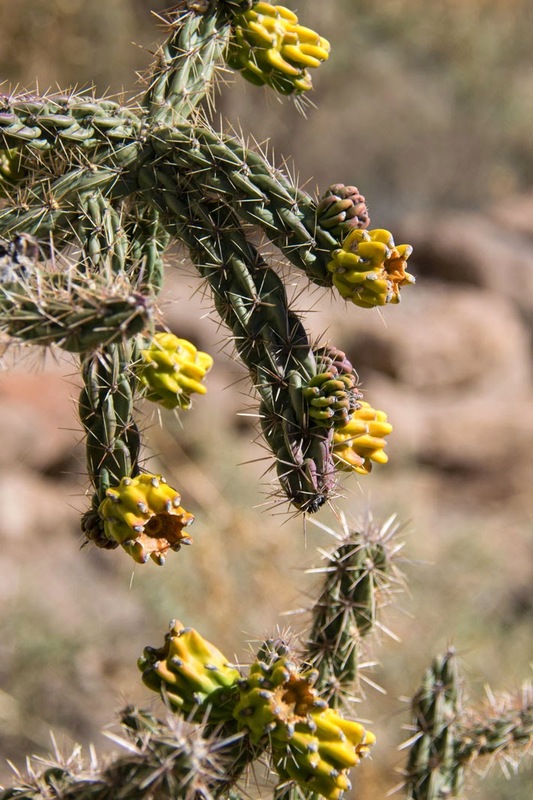 Amazing high desert plant life. 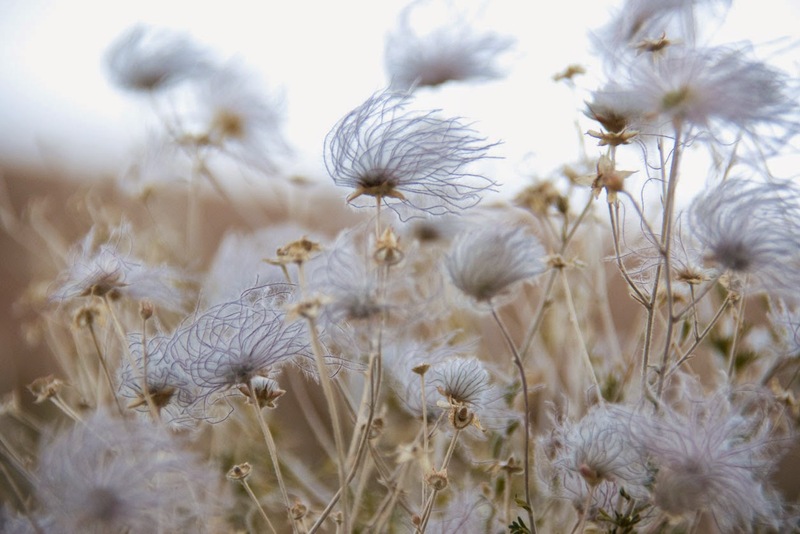 It all seems so perfectly evolved to spread seeds in any way possible. This is the first time I really started to feel the altitude. I'm a sea level dweller for most of the year. Being between 6000 and 7000 feet caught up to me as we went up hill. The thin air and my lungs were having an argument. But it was a pleasant enough walk that yielded a big surprise. 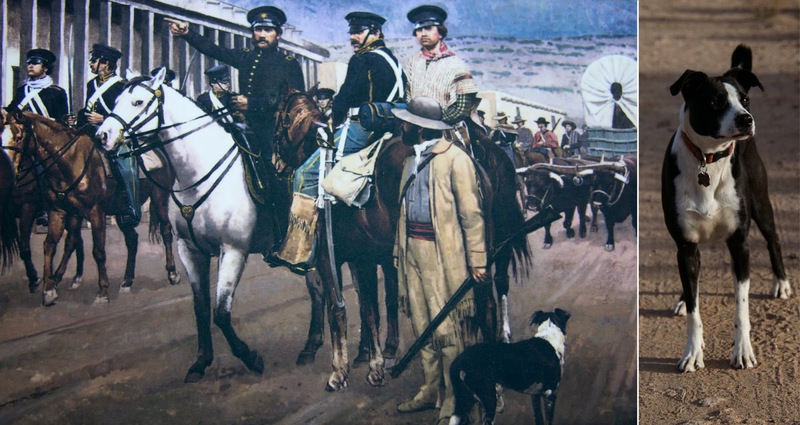 We reached Fort Marcy and as we read the placards we discovered Chena was a time traveler and a portrait of her was included in the illustration of General Stephen W. Kearney marching with his troops into Santa Fe in 1846 during the United States' war with Mexico begun early that year over a border dispute. Chena is a time traveler. Looks like she stepped right out of the painting. 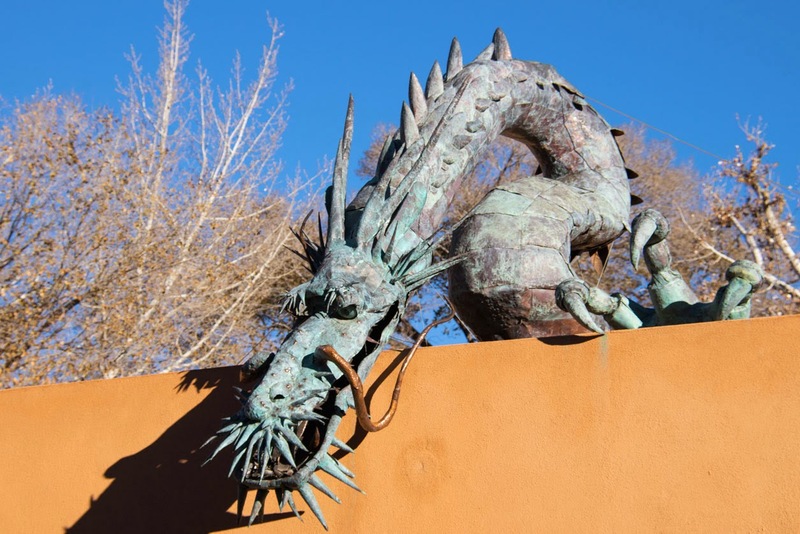 We headed into the center of Santa Fe and at breakfast at the Palacio Cafe. 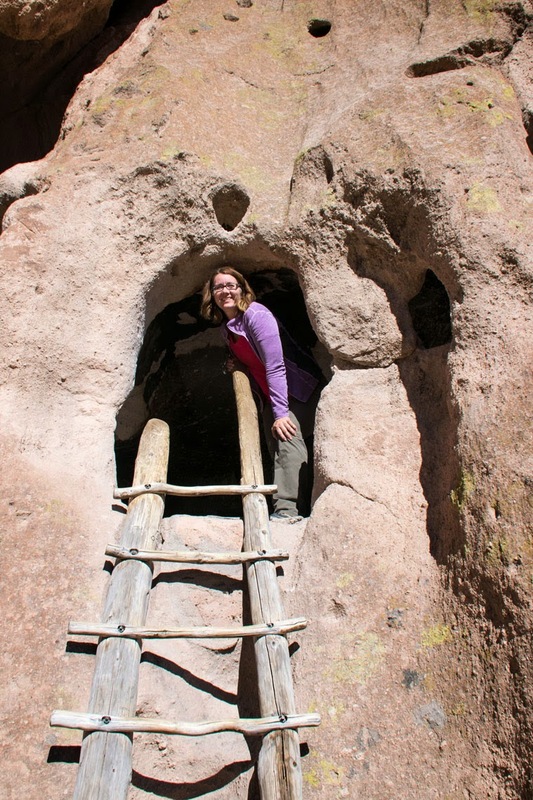 And then we headed out to Bandelier National Monument. 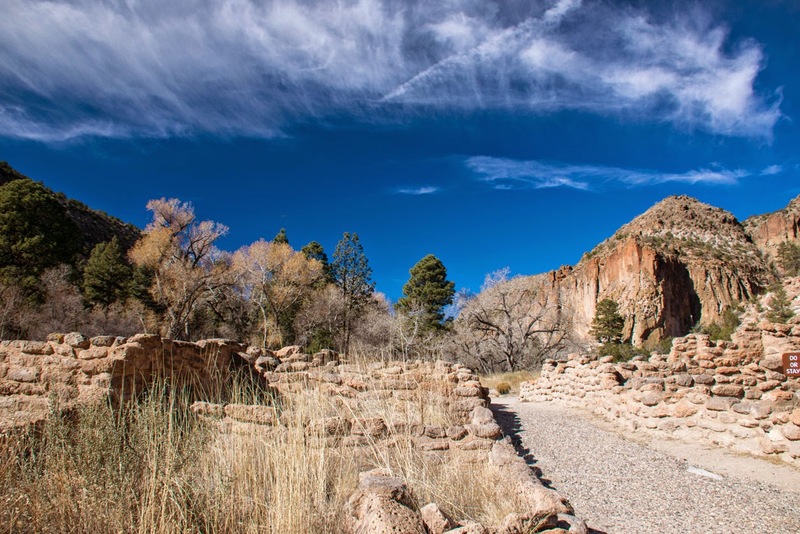 Bandelier National Monument sits at the south end of the Pajarito Plateau, which was formed by two volcanic eruptions 1.6 and 1.4 million years ago. 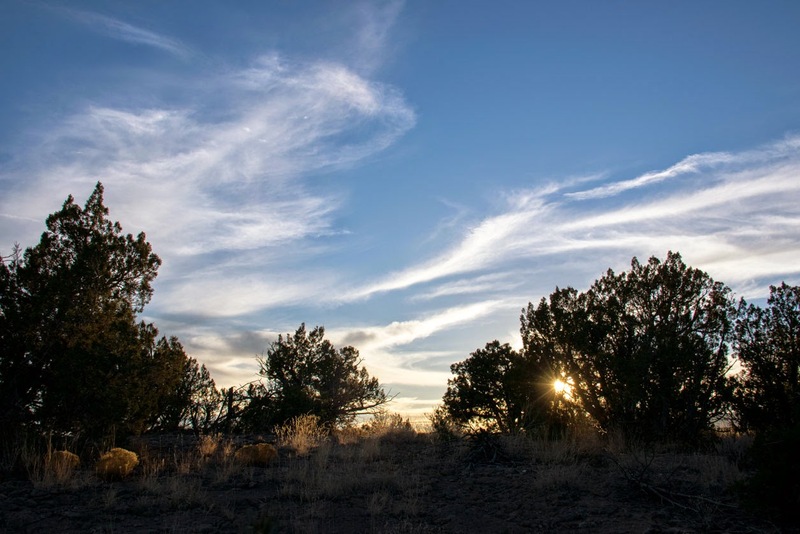 The monument consists of 33,000 acres of canyon and mesa country characterized by incredible biological diversity and marked by evidence of human occupation going back to over 11,000 years ago. 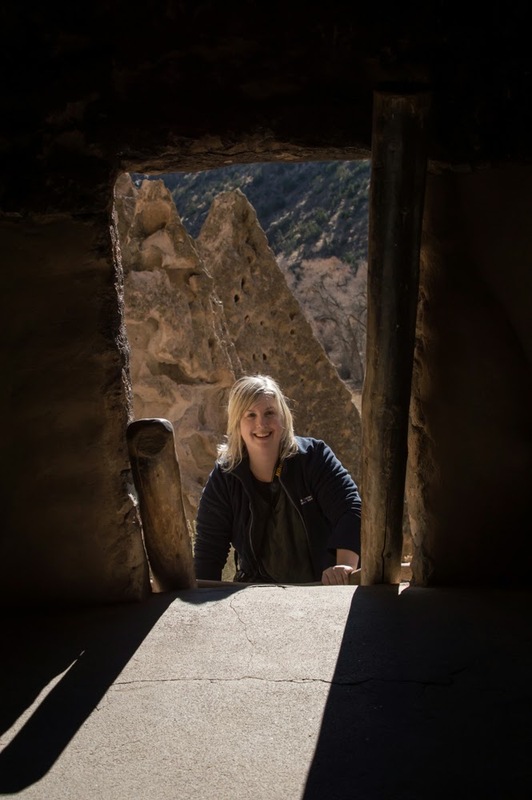 Here you can explore cliff dwellings carved into the volcanic tuff cliffs that form the walls of Frijoles Canyon as well as standing masonry walls, remnants of buildings dating back, in some cases to nearly 1000 years ago. 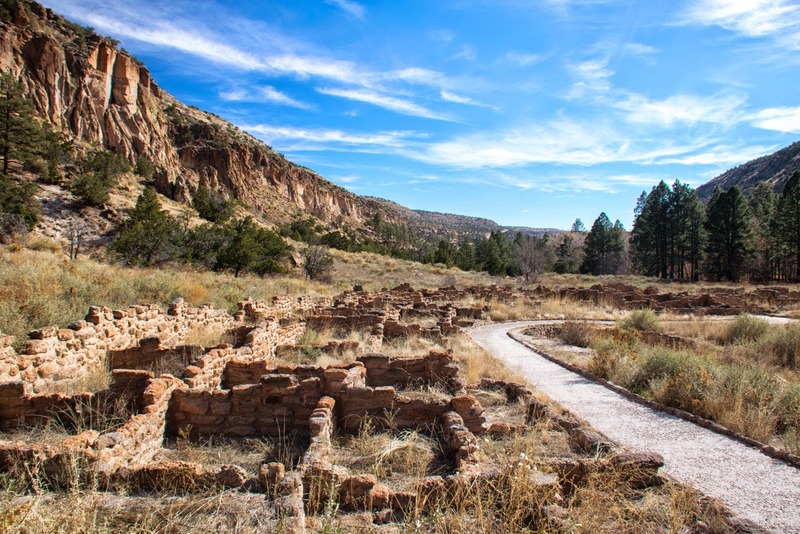 Here you get a glimpse into the past of the Ancenstral Puebloan peoples, a culture that still survives today in surrounding communities. 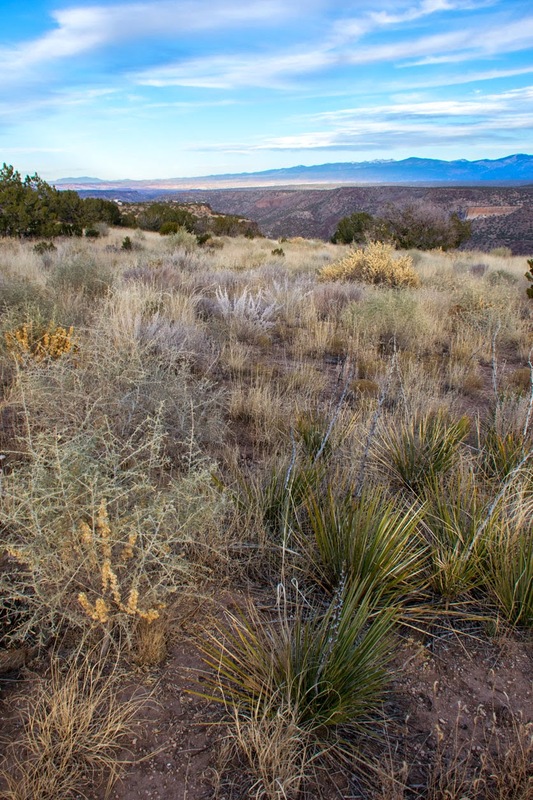 One of the reasons why Frijoles Canyon made an optimal place to live is that it is an ecotone, a transition zone where plants and animals from several biological communities mingle. In an ecotone the number of species is greater than in any one community alone. 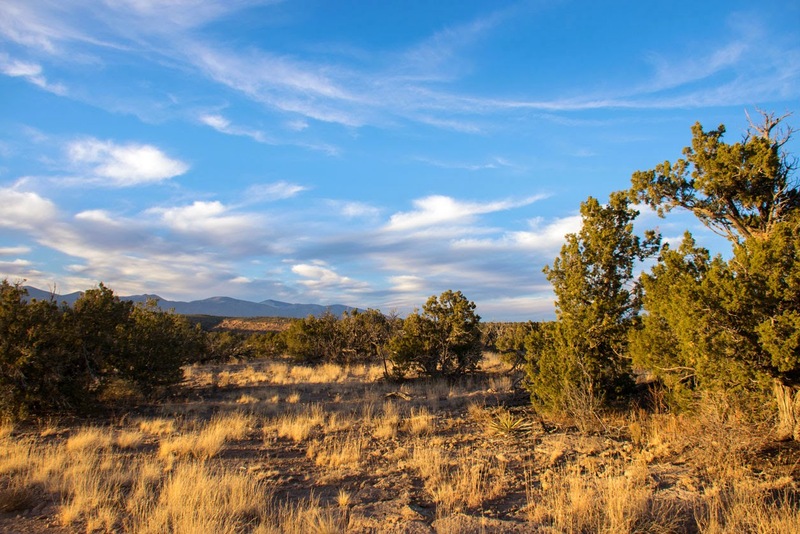 Here you find ecosystems ranging from high desert to wooded mountains, and shaded rivers. 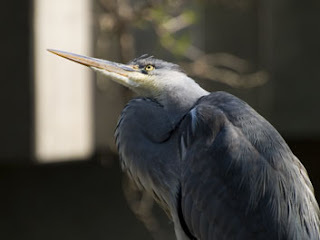 This environment supports an incredible diversity of plant life and at least 150 species of birds, 54 mammals, and 37 reptiles. 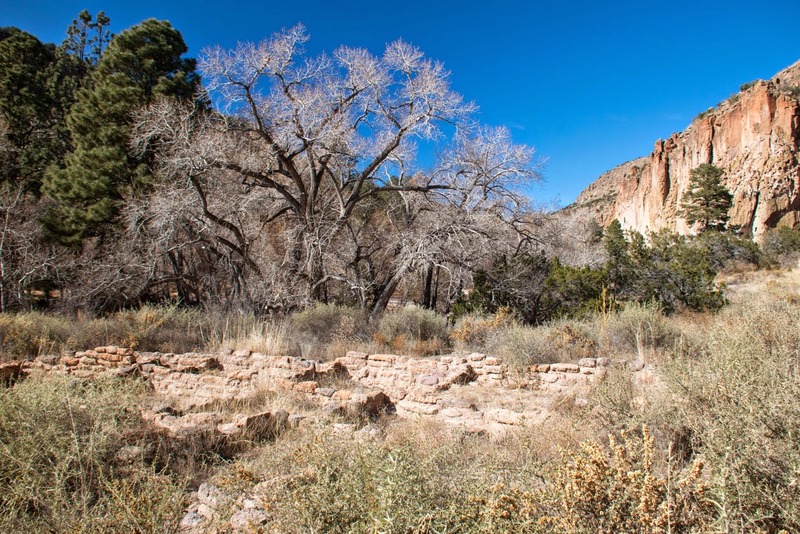 For nearly 500 years, until the late 1500s when the Spanish arrived, the communities living within Frijoles canyon thrived. 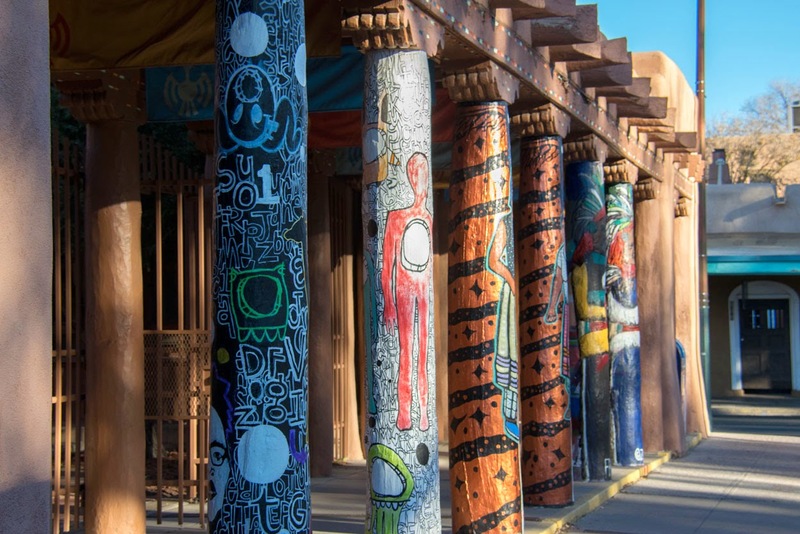 This was a vibrant society that had trade ties from Central Mexico to Baja California. They were farmers, planting maize, beans and squash on the mesa tops. They hunted and trapped deer, rabbits, squirrels, birds and other animals. They took advantage of the great diversity of local flora to supplement their diet. Dogs were companions and hunting partners. 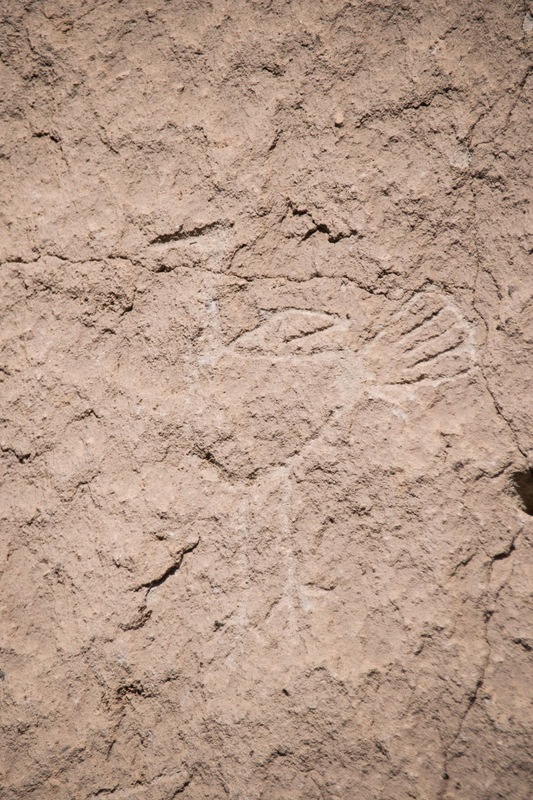 Turkeys were domesticated for food and feathers (woven with yucca into blankets among other uses). Nearby basalt sources were mined for material for use as hammers and axes. Very good quality obsidian, also found nearby, was turned into arrowheads, blades, and scrapers. The obsidian was also an integral part of the materials traded to far reaching communities across the southwest and Mexico. 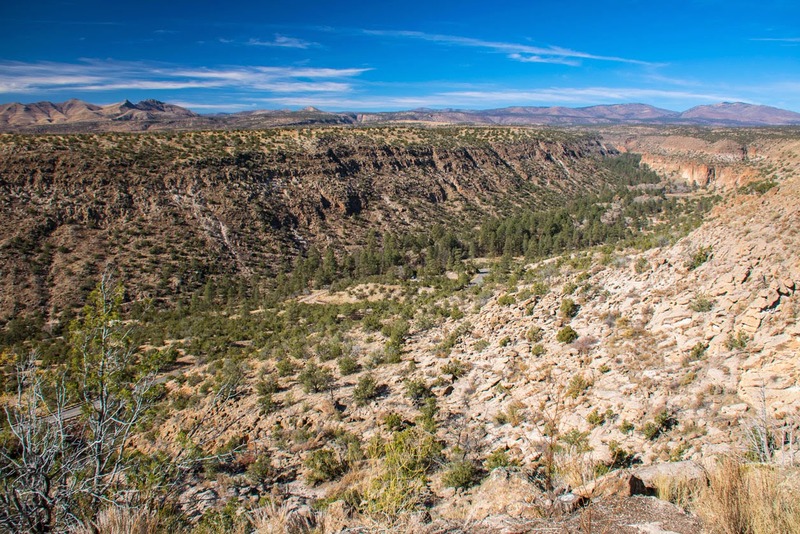 When you first drive into the park lands you are greeted with an incredible view of the canyon. As we drove down into the canyon I got a glimpse of a first red-shafted Northern Flicker. When you first drive into the Visitor's Center you can still see the remarkable flood damage that occurred in 2011. Frijoles Creek winds along the canyon bottom. The violence of the flood is evident anywhere you walk along its banks. Entire trees were ripped out from their roots and piled high by the flood waters against any obstacle strong enough to withstand the onslaught. Traveler Thirteen and I walked the Main Loop, passing the Big Kiva, Tyuonyi, the Cliff Dwellings and then headed out to the Alcove House trail (formerly known as the Ceremonial Cave trail), then back down the Nature Trail to the parking area. As we walked, rock squirrels chastised us from the tops of pine trees. 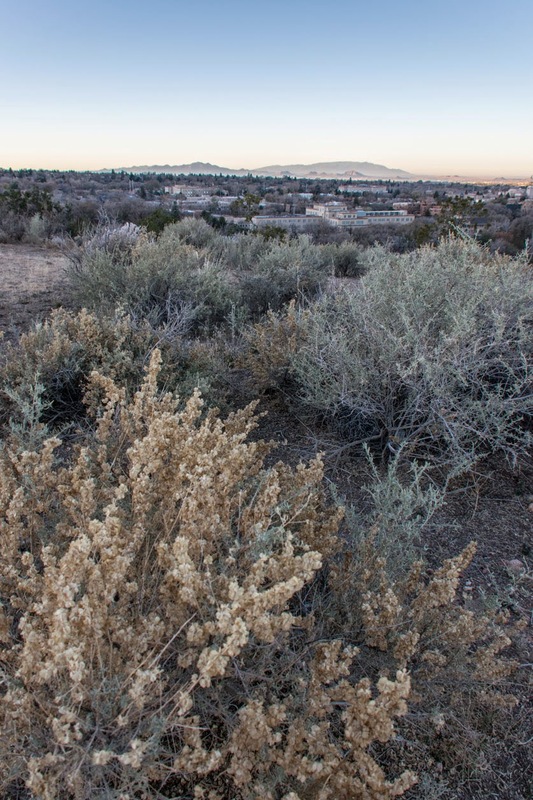 Canyon towhees and other birds flitted through the underbrush. The Big Kiva. This structure would have been covered by a roof of earth and wood. Entrance would have been through a door in the roof. You would have climbed down into a darkened room light by by torches. This was the very heart of the community. The first structure we encountered was the Big Kiva, a communal meeting place, important for both religious and community activities. Farther down the path we encountered the tuff stone masonry walls of what was a huge two story circular building that made up the village of Tyuonyi. It must have been impressive when still standing its with over 400 rooms that housed at least 100 people. Many of the rooms were used for food storage and some housed turkeys. It's central plaza contains three kivas. Entrance into the village/building was through one single ground-level opening. Construction began on it over 600 years ago. 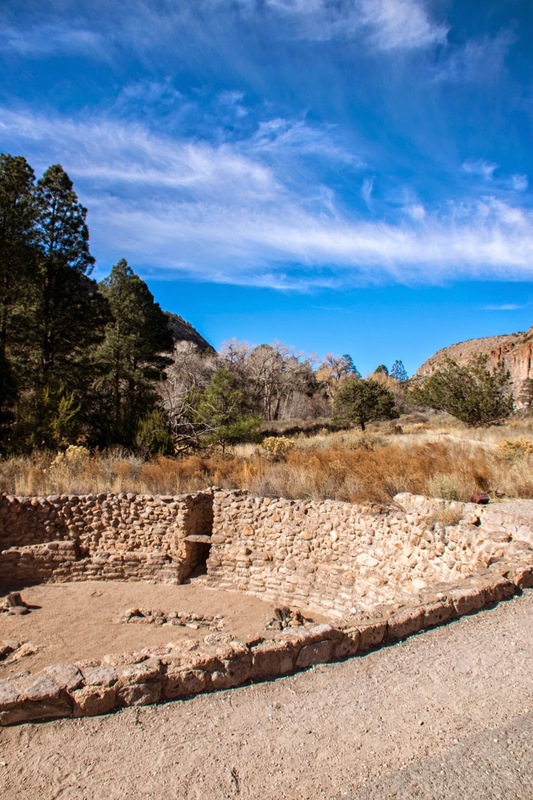 It was occupied at the same time as the cliff dwellings were. Looking up toward where the Talus houses and cavetes are. On the right you can see a rebuilt talus house. On the middle far left, if you find the red dot. That's a person climbing into a cavate. The village of Tyuonyi from above. 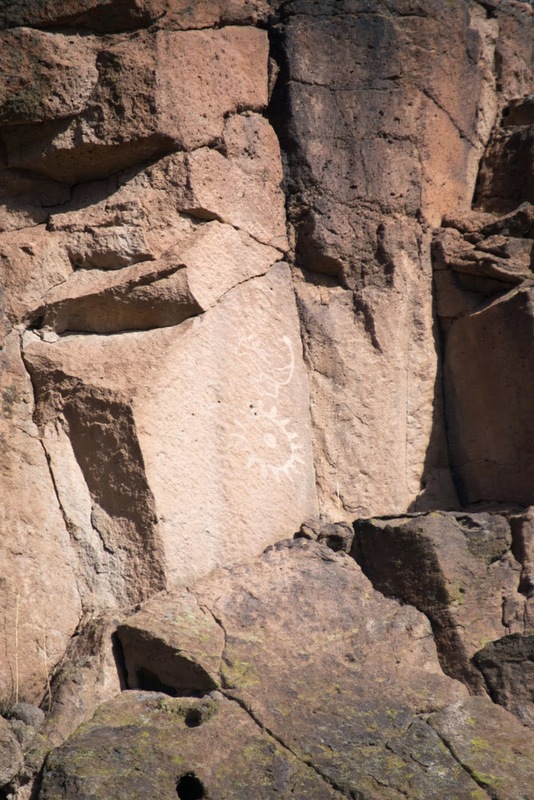 Then we walked along the cliff face, investigating the remnants of talus houses (built on the rock debris (talus) slopes on the sunny sides of the canyon and cavates, rooms dug into the cliff face itself, and the occasional petroglyph. It was amazing climbing up the ladders into the cavates. I imagined what it must have been like to be a child growing up here gamboling up and down ladders or what it must have been like to be relatively old or arthritic and still navigating the ladders and passages through these amazing buildings. A cavete. Dwellings would have been built up several stories against the rock face in addition to the excavated rooms going into the cliff. Me, climbing in to the cavate that was a kiva. Photo by Traveler Thirteen. 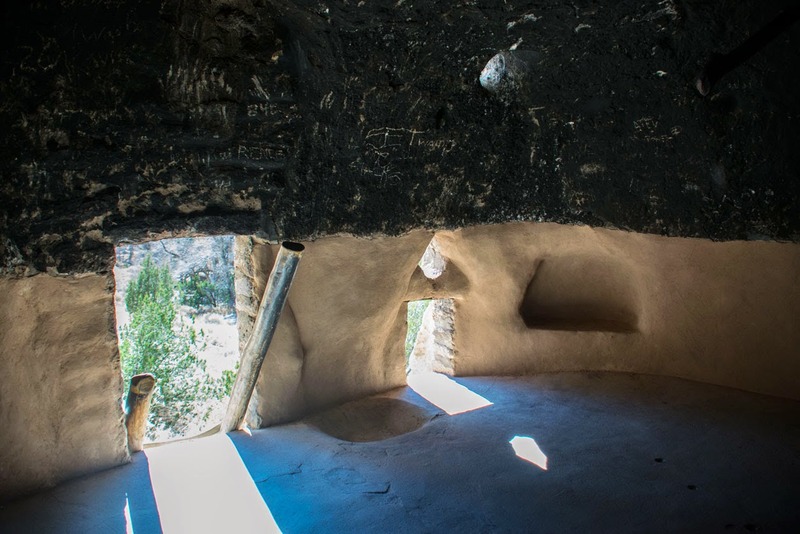 The interior of the cavate/kiva. The walls and ceiling have been replastered with mud and blackened as they would have been 500 years ago. Smoking the ceiling would have helped stabilize it. 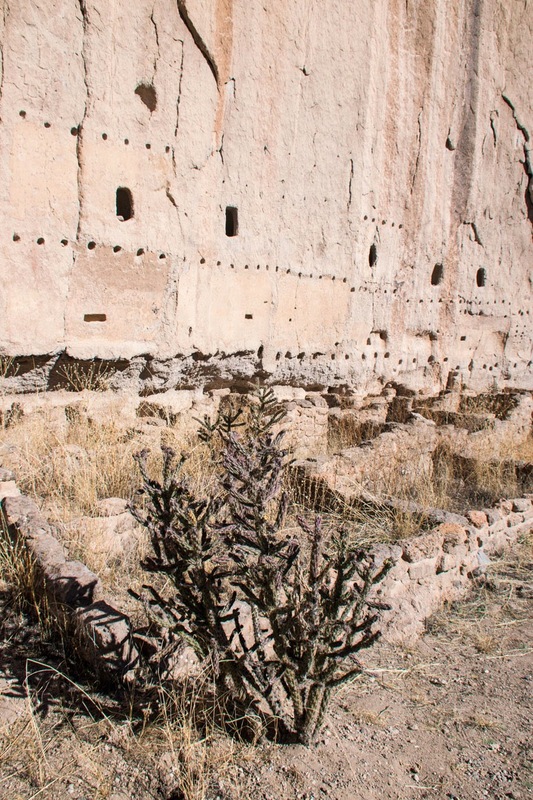 Here you can see the foundations of the cliff side dwellings. 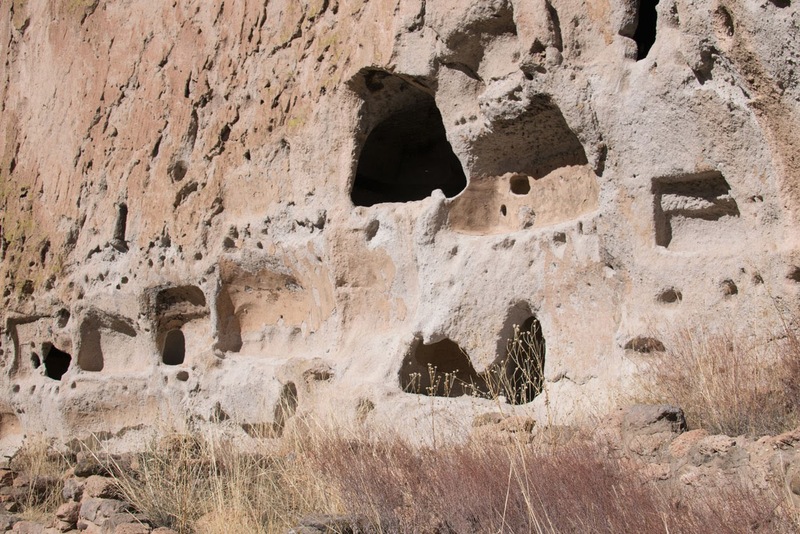 The post holes or "viga" holes show how high up the cliff face dwellings were built. You can also see entrances to cavates carved into the living rock itself. 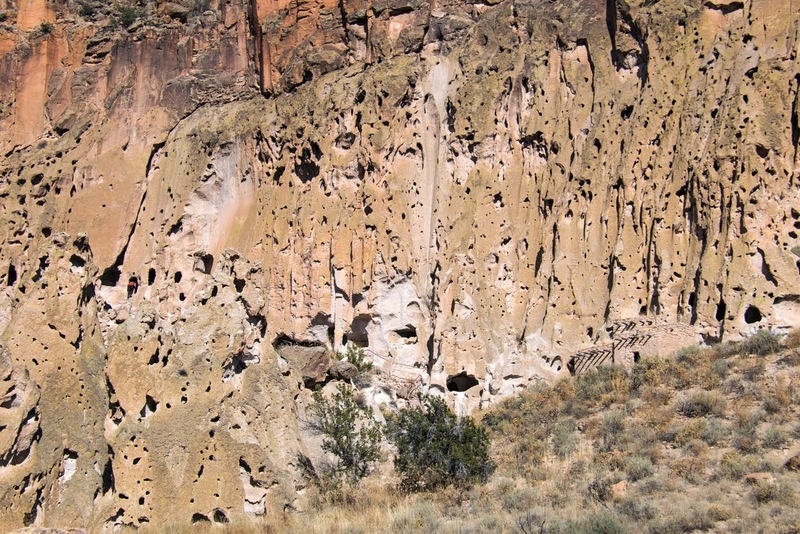 More detail of the remnants of the cliff side dwellings. 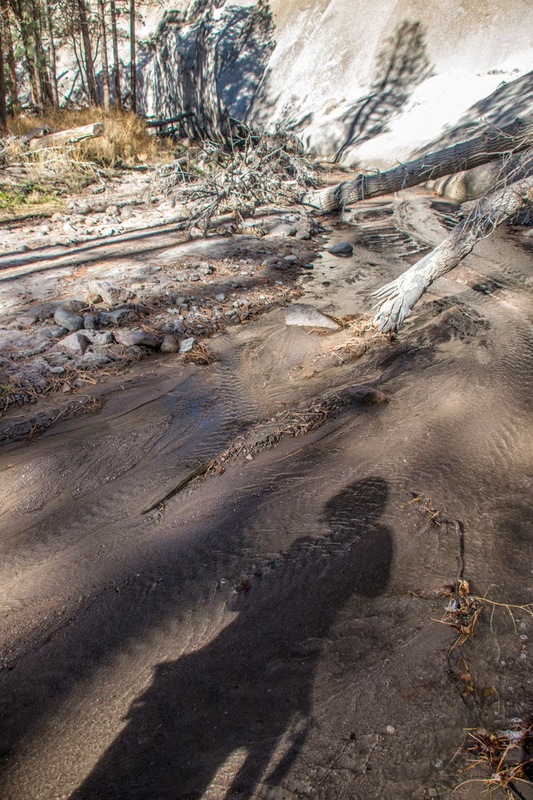 Frijoles Creek showing evidences of past flooding (snapped trees) and Traveler Thirteen's shadow. Then we did something I didn't think I could do. We hiked out to the Alcove House. 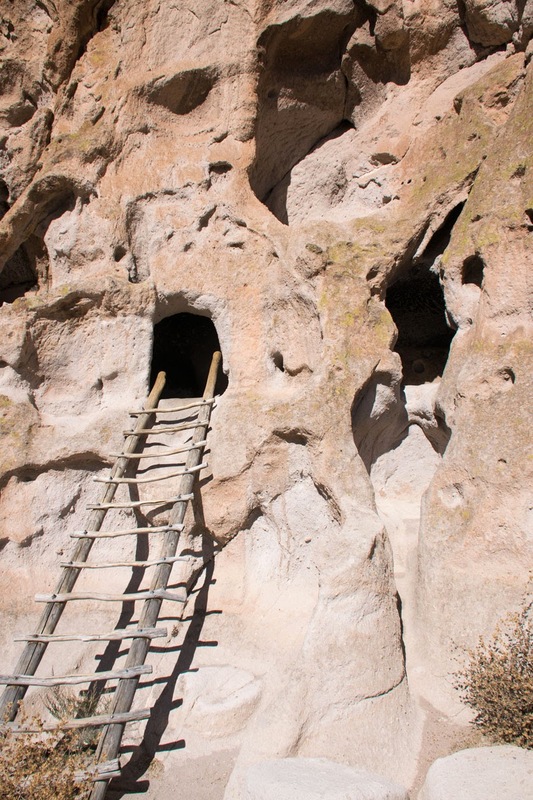 Here you are presented with a climb up 4 ladders and narrow rock staircases to reach a reconstructed kiva site. This means climbing up and down many ladder rungs. The climb is about 140 feet. You can see a clear photo here of what I'm talking about that will give you a sense of how epic the climb is. 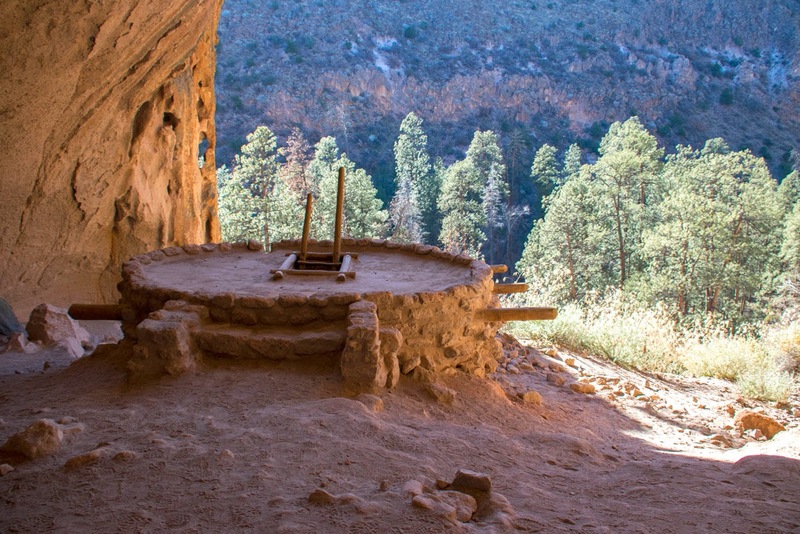 The Alcove House (or Ceremonial Cave). A rebuilt kiva. I'm afraid of heights. I'm especially afraid of going down ladders. And thanks to neck/back injuries I don't think I could have done this climb at all a couple of years ago. In fact it would have been unthinkable. But I did it. I climbed those damned ladders. But more importantly, I climbed back down them. Down was worse. It's that moment when you first transfer your body and weight onto to the ladder and try to step down. It's an awkward position and I tried to keep visions of myself falling onto the rocks below from overtaking my brain as I did it. And I did do it. And I'm proud of myself for having done this. It was both a mental and physical test. I can't express fully how important that was to me. But it was an amazing moment that happened in an amazing environment. I had a new spring in my step as I walked back to the Visitor's Center, despite most of my muscles feeling like Jello from climbing up and down. On the way I studied the trees and birds and even saw a a female Williamson's Sapsucker skulking about on a pine. After this it was time to take the dogs for a walk. 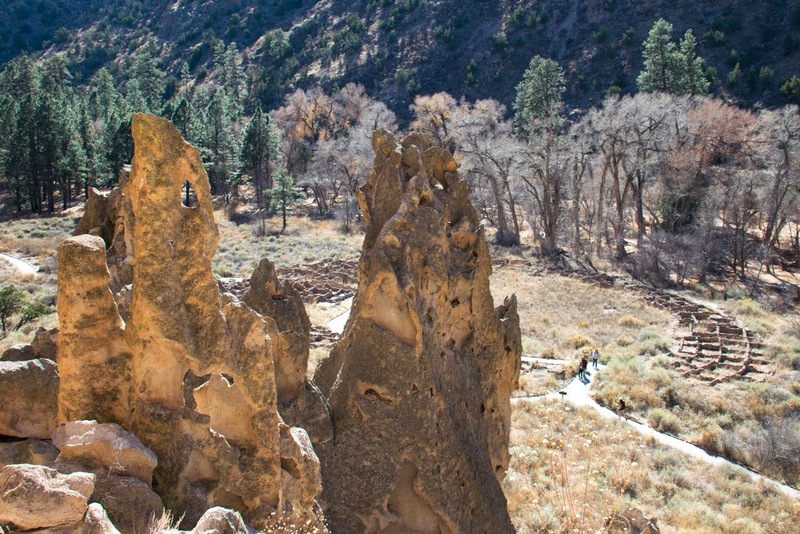 Off of Route 4, on the way to and from Bandelier, you can find 11 entrances to the Santa Fe National Forest. 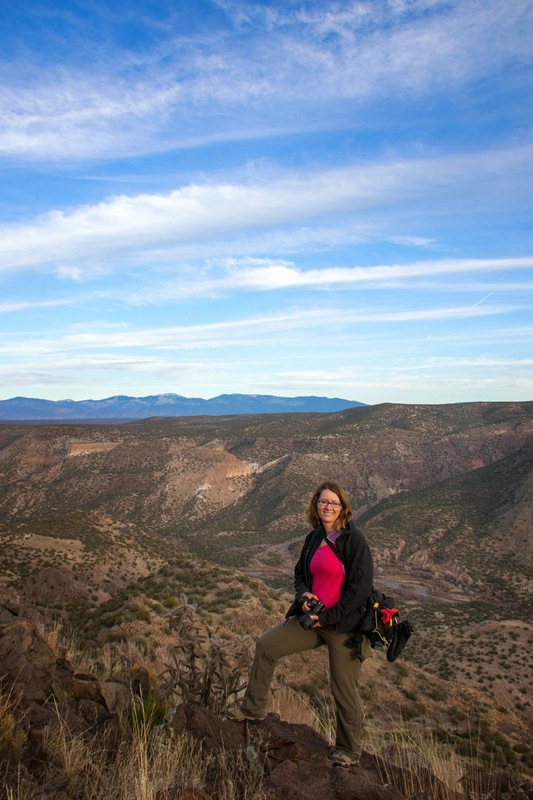 We investigated all of them and opted for hiking out to the Rio Grande Gorge through entrance four. This is a relatively easy hike, that is if you aren't gasping for air as you go uphill because of the elevation like I was. Chena accompanied us on the 2.5 mile hike out to the gorge ridge. As Chena chased scent trails we humans couldn't smell and sounds we couldn't hear or stuck her head in animal made holes (which we tried to discourage since who knows what's in that hole...), we walked surrounded by a fleet of American Robins. Ravens too flew by. Juncos too flitted in large numbers through the low pines and bushes. And Mountian Bluebirds echoed the sky as they flew by. Then something amazing happened. We heard high pitched honking sounds. 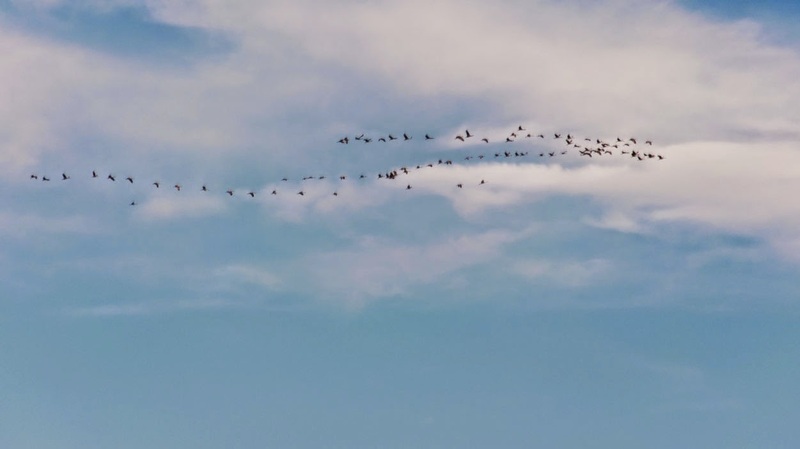 Up in the sky several large groups of migrating Sandhill Cranes cruised by in disorganized V shapes. Then we reached the gorge as the sun started to get low in the sky. It was like staring into an immense time machine, looking down into the layers upon layers of the Earth the river had carved its way through. Rio Grand Gorge. Looking northeast. 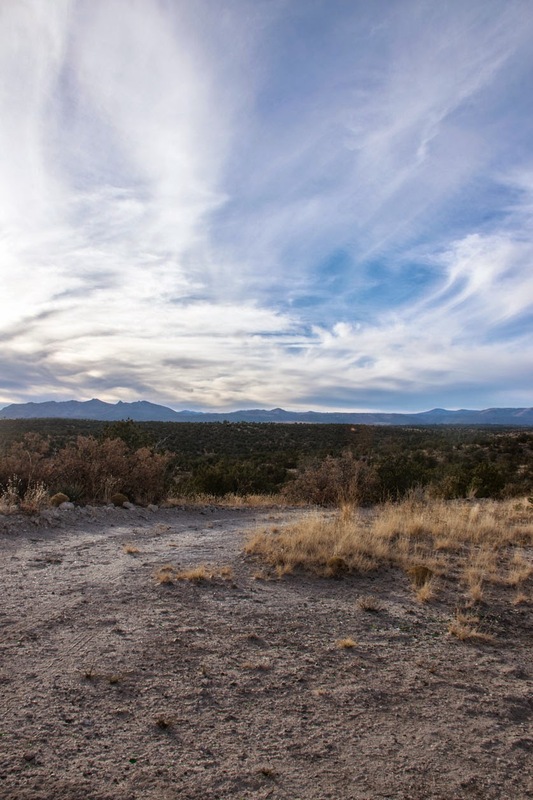 New Mexico does "sky" really well. 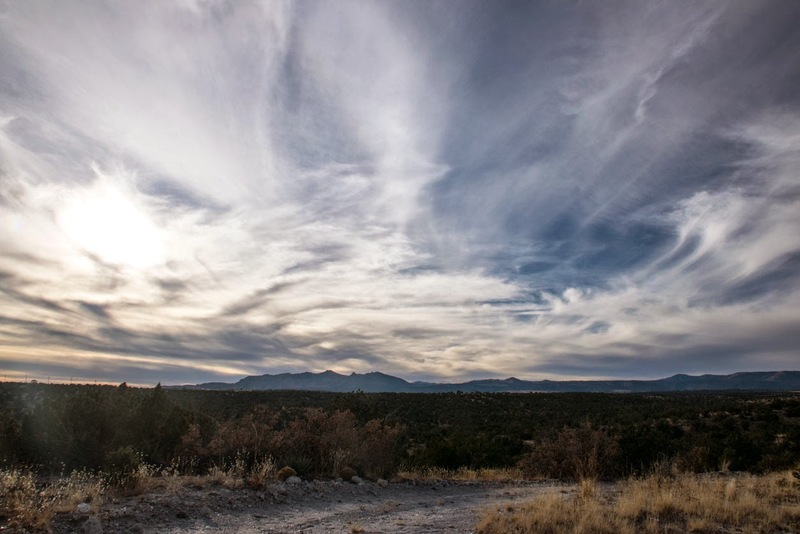 Santa Fe National Forest, sunset. 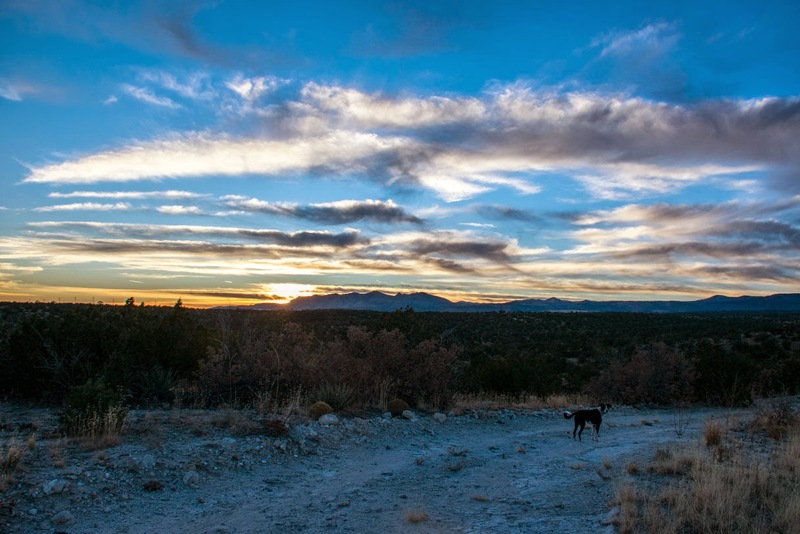 Santa Fe National Forest, sunset, with Chena. On the way back, as the sky did amazing things as the sun went down, Chena got us throwing sticks for her. She has Thirteen well trained. She even allowed me to throw the stick for her. I was honored. 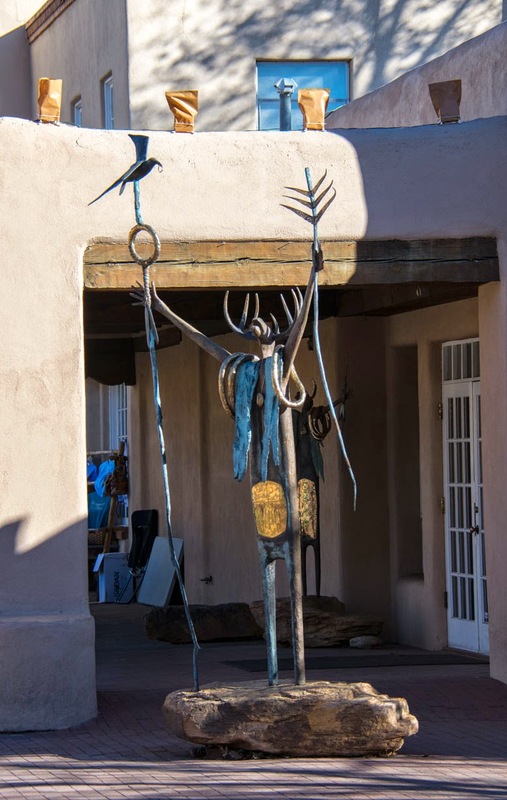 Back in Santa Fe we had Indian food for dinner. I know... it should have been southwestern specialties while we were there but...its INDIAN food and both Thirteen and I really like it and I can't say no to naan. We went to Raaga. It was quite good, though parking for large vehicles is an issue as its located in a mostly residential area. The owner was attentive and asked me a lot about how it compared to Indian restaurants in Boston. He shocked me and actually knew the name of one restaurant I used to eat lunch at quite frequently and wanted to know if Raaga was better than that place. Yes, Raaga is way better than Kashmir. Bostonians, you know what I'm talking about.